Joe: Here’s where I think freelancers can use a bit of Salesmanship 101. During a stint I did as a sales manager for a magazine, we always talked in terms of the “sales funnel.” The concept dates back to the 1800s, according to this article—AIDA Sales Funnel—but even in the late ’90s it still held credence. The concept here is pretty self explanatory, but the point is this: Even the best salespeople don’t expect to close every deal! 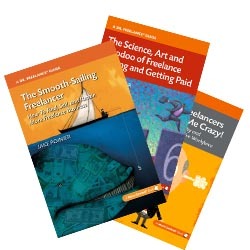 From the sound of it, you’d benefit from more sheer volume of possible freelance jobs–whether you get them from email campaigns, cold calling, or old-fashioned networking. Ultimately, the more good clients you have, the more referrals you get–which has the benefit of bypassing the funnel process.